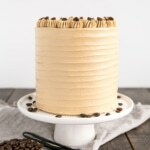 This Vanilla Latte Cake transforms a classic coffee beverage into a delicious dessert! Infused with espresso and vanilla, it is perfect for the coffee lover in your life. Man, I’ve had some serious baking fails over the past couple weeks. The other day I was baking cake layers for an upcoming post and checked on them too early. They weren’t quite set yet when I moved them around in the oven, so they totally caved in. I could literally see them falling before my eyes. SO sad (they still tasted good though). With this Vanilla Latte Cake it was quite the opposite. I overbaked the layers for fear of underbaking, and the cake came out dry. I didn’t realize this until I cut into it though — there isn’t really an easy way to tell a cake is overbaked unless it’s burnt (lol). I had the foresight to douse the layers with some simple syrup before stacking, but even that didn’t help much. Learn from my mistakes, people. Don’t check your cakes too early or too late. Baking is stressful, amirite? If you haven’t noticed, I am a HUGE fan of coffee flavoured desserts. It’s honestly one of my favourite flavours. 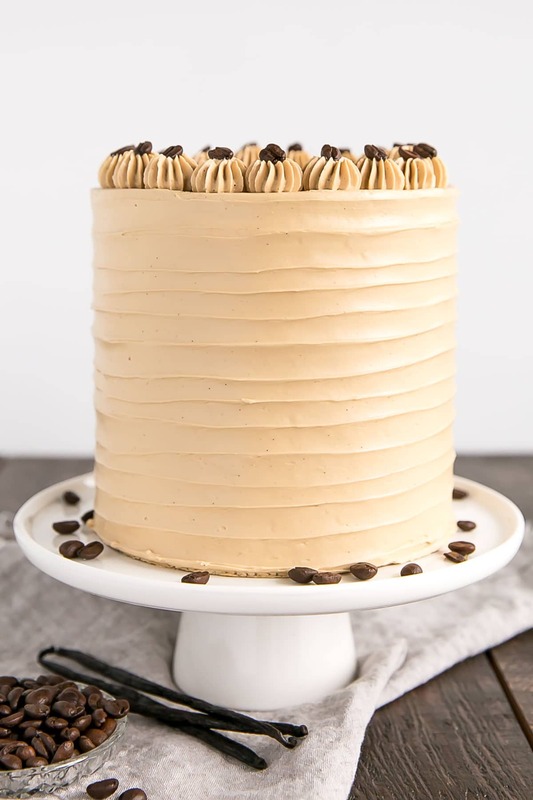 I especially love coffee and chocolate together, but today I wanted to try something different with this Vanilla Latte Cake. 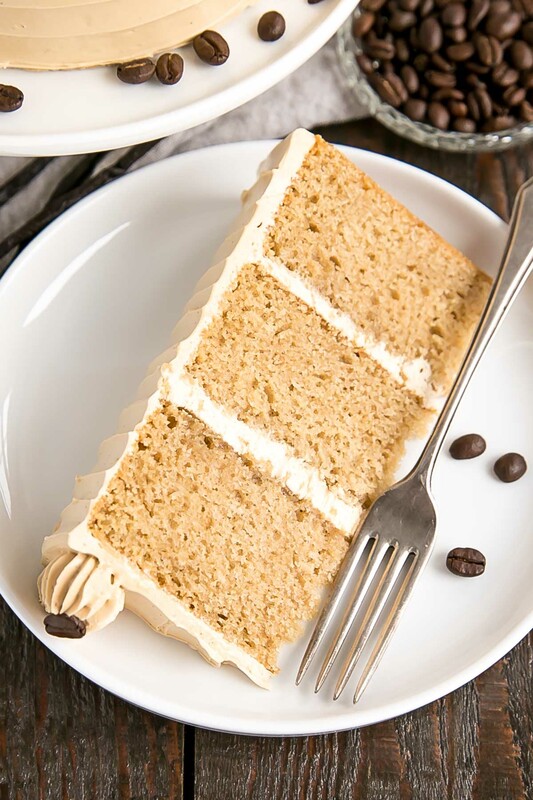 The key components in this cake are instant espresso powder and vanilla bean paste. My pantry is always stocked with these items because I love and use them so much. If you don’t have either of these, this recipe will still work with any instant espresso and regular vanilla. 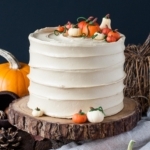 You won’t have vanilla bean flecks in your cake or frosting, but the taste will be similar. It’s important to note that the espresso powder I use is very fine — almost the consistency of powdered sugar. It is not granules. You can use instant espresso granules, but you’ll need to dissolve them first for use in the frosting (see recipe notes for details). 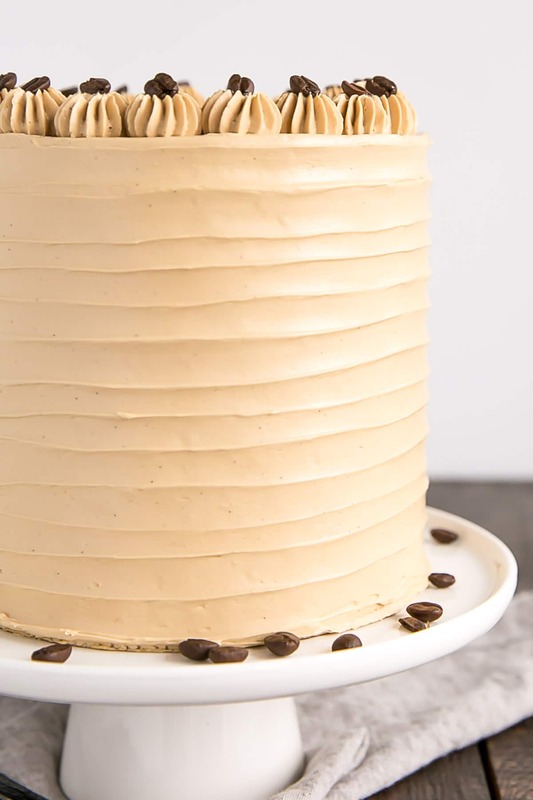 To infuse the coffee flavour into the cake layers, all I did was take my favourite Vanilla Cake recipe and dissolve some espresso powder right into the milk. You can add more if you like, for a more intense flavour. 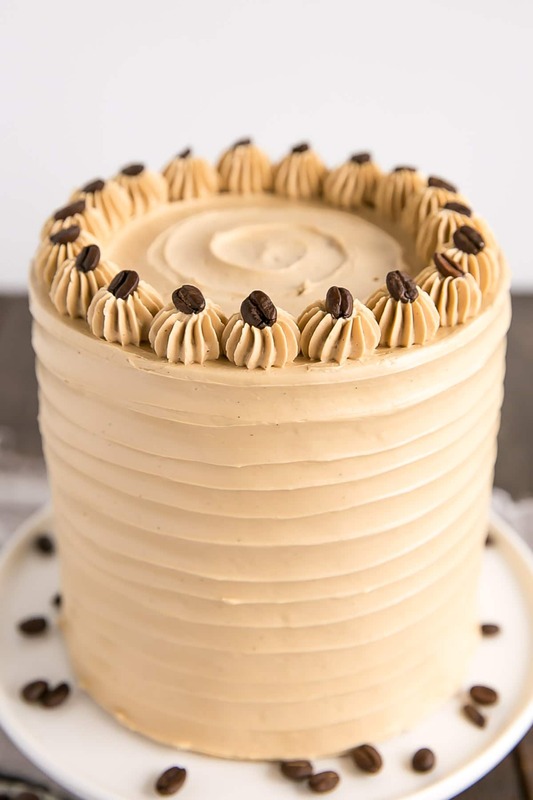 The buttercream is a Swiss Meringue which I’ve made before, but I added more espresso powder this time to intensify the flavour and, of course, the vanilla bean paste. 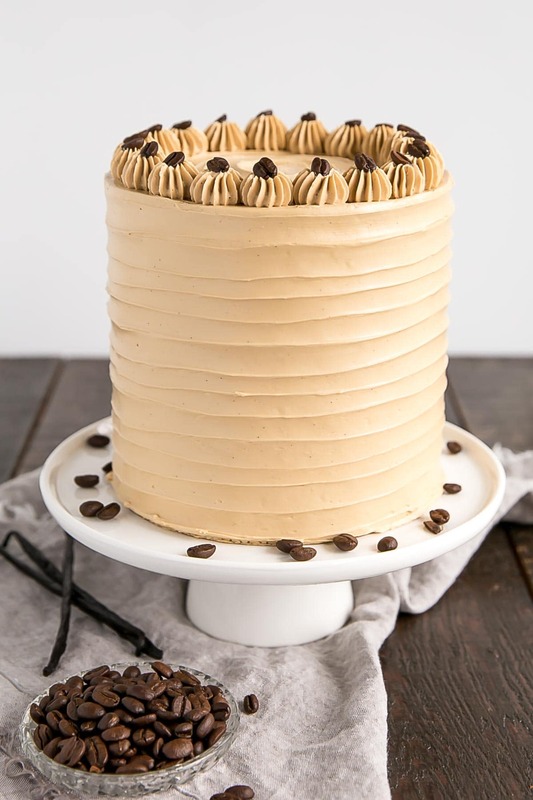 If you’re a coffee lover like I am, or have one in your life, this cake is the perfect treat! 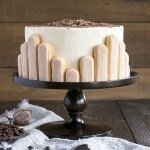 Looking for more coffee flavoured desserts?? 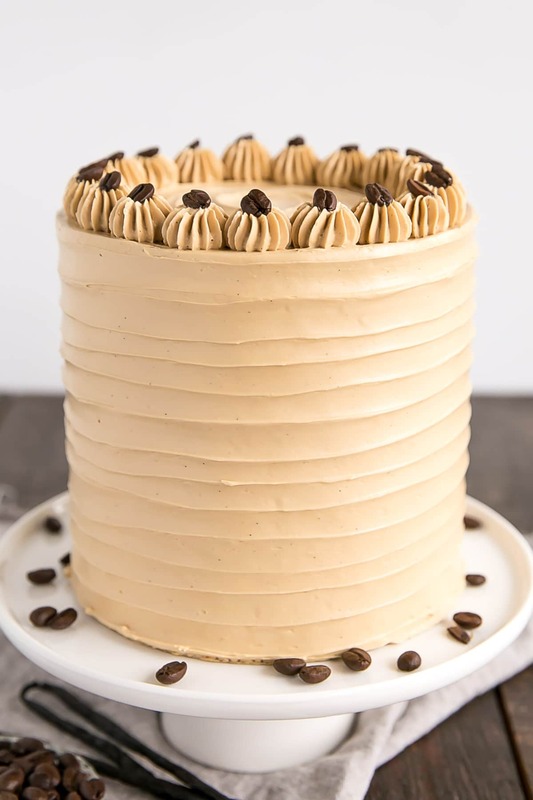 Be sure to use instant espresso powder, not granules, especially in the frosting. See recipe notes for modification if you can’t find the powder. You can use regular vanilla instead of vanilla bean paste. 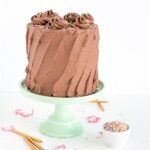 The flavour will be the same, you just won’t have flecks of vanilla bean seeds throughout the frosting. 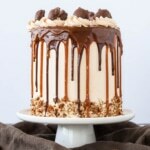 I used a small offset spatula to do the swirl on the top and sides of the cake and a 6B tip to pipe the dollops on top. In a small measuring cup, combine room temperature milk & espresso powder. Stir until dissolved. Set aside. Using a stand mixer fitted with a paddle attachment, cream butter and sugar on med-high until pale and fluffy (approx 3mins). Reduce speed and add eggs one at a time fully incorporating after each addition. Add vanilla vanilla bean paste. Alternate adding flour mixture and espresso milk, beginning and ending with flour (3 additions of flour and 2 of milk). Fully incorporating after each addition. Add vanilla bean paste and espresso powder. Whip until smooth. Frost the top and sides of the cake and smooth with an icing smoother. Do a swirl pattern on the sides and top of the cake. Rotate the turntable while pressing a small offset spatula into the frosting. Start at the bottom and slowly move up to the top of the cake. Pipe small dollops on top using a 6B tip with remainder of frosting. Decorate with whole coffee beans if desired. * If you can't find very fine espresso powder, you can dissolve the 2Tbsp in 1 Tbsp hot water. Cool completely before adding to the frosting. 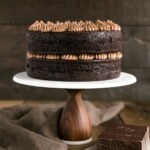 I was wondering if this cake could be fitted into a 9 inch pan, and if so would it need to be doubled or tripled? For anyone interested, you can get about 75 mini cupcakes from this recipe. Thanks so much for the tip, Kathy!! Hello Olivia, may I know are most of your cakes moist and fluffy or are they dense and moist? How do you recommend baking this in 8″ rounds? Preferably two layers? Hi Ali! Leave the recipe as is for two 8″ pans. Baking time should be somewhat similar as well. Hi Natika! I’m so happy to hear that you both loved it! Have you tried this recipe as cupcakes? Hi Dawn! I have not, but it should work totally fine! 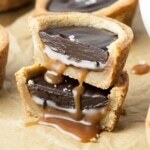 I’m making this on Sunday – can’t wait! It was AMAZING!! A massive hit in the office. The only wobble I had was split buttercream, which was rescued after I zapped a bit of it in the microwave and mixed it back in. 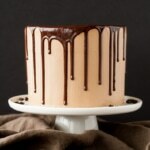 I love the way the buttercream goes from speckled to a gorgeous beige as the coffee powder dissolved. Great recipe – thank you! 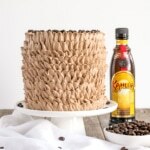 This cake is so tempting, loved the idea of the flavors of coffee mixed with cake. it is just amazing.